The British Medical Association has for several months been pressing Prime Minister David Cameron and his Conservative Government to answer questions on the funding, staffing and future of the NHS in its #Showusthe7dayplan campaign. In August, Cameron announced his vision for a "truly seven-day NHS" – something the BMA and doctors say they support, in principle at least. 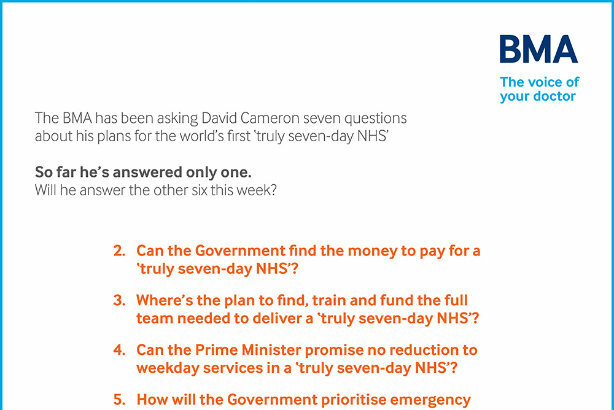 With the aim of ensuring the NHS was not used as a political football to secure good press for the Government, the BMA posed the PM seven questions, which it published in adverts taken out in seven different newspapers over seven consecutive days. A dedicated section of the BMA website was created to support the campaign, which includes a petition to Cameron that the BMA says has been signed by more than 10,000 people. Gareth Parry Jones, head of media for the BMA, told PRWeek that the campaign was conceived by the BMA's in-house team, saying: "The ultimate goal of the #Showusthe7dayplan campaign was not to allow the Government to get away with announcing a policy with no detail about how it would be achieved, simply to gain positive headlines. "Requests for the details on a change of this magnitude had been rebuffed by the Department of Health up until our questions received public prominence. The aim therefore was to bring this issue to the public fore and try to get detailed answers to these important questions." The seven-day NHS was one of the first major announcements to the new Parliament. Jones said: "It was clear that this was going to be an issue that was going to run from Downing Street and not the Department of Health – and this has shown to be the case." Jones describes that the BMA built on its initial ads and press activity from August, saying: "We followed this up across social media using the hashtag #showusthe7dayplan in order to put further pressure on Cameron. After months of stonewalling, in September the Government finally answered one of the questions – 'can you define what you mean by seven-day services?' – but nothing more." He said Cameron's definition echoed the BMA's calls for focus on the delivery of urgent and emergency care. The BMA then released new ads this week to coincide with the Conservative Party Conference, in which it said that while one of the questions had been answered, six remained. While Cameron has told the conference that NHS funding would be protected, the BMA will continue to ask Cameron for more clarity. BMA chair Dr Mark Porter has also asked for answers to the remaining six questions, saying: "Guarantees on investment are only good enough if they can truly keep up with rising demand, and if the NHS is to survive we need an evidenced, long-term solution to the funding crisis facing the health service. Without this, our NHS – which is the best healthcare system in the world – simply won’t be able to cope, the quality of services will be compromised and, crucially, patients will suffer." Media reports say that since the introduction of the seven-day NHS plan, there has been a dramatic increase in the number of doctors submitting applications to work abroad – with a jump from 25 to 500 applications a day reported in September.